More background information about Zen yoga. Zen yoga emphasizes three intertwined areas of physical alignment, flow of energy in the body, and awareness (or mindfulness). Mindfulness of the body is one of the four practices taught by the Buddha that leads to enlightenment. Some Zen temples include a taiso (exercise) period, often early in the morning, including yoga-like postures, quick repetitive exercises, and/or more flowing exercises reminiscent of Tai Chi. These exercises are designed to open and unblock the body in preparation for sitting meditation, develop a deeper awareness of the body, and as an opportunity to practice “becoming one” with what’s happening in the moment (expressed in Japanese through the terms narikiru – become one – or ima-koko – now-here). 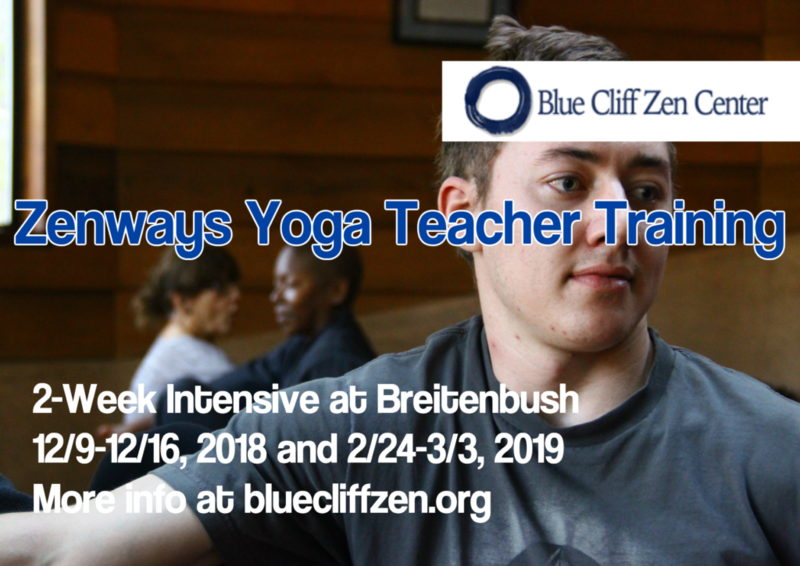 The 200 hour Zenways yoga teacher training is led by Blue Cliff Zen Center in collaboration with London Zenways. For more information please visit the Yoga Teacher Training Page.